Understanding the geochemical cycling of sulfur in sediments is important because it can have implications for both modern environments (e.g., deterioration of water quality) and interpretation of the ancient past (e.g., sediment C/S ratios can be used as indicators of palaeodepositional environment). 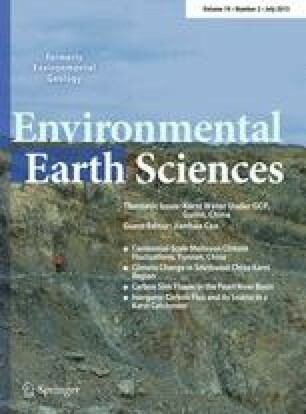 This study investigates the geochemical characteristics of sulfur, iron, and organic carbon in fluvial and coastal surface sediments of the Laizhou Bay region, China. A total of 63 sediment samples were taken across the whole Laizhou Bay marine region and the 14 major tidal rivers draining into it. Acid volatile sulfur, chromium (II)-reducible sulfur and elemental sulfur, total organic carbon, and total nitrogen were present in higher concentrations in the fluvial sediment than in the marine sediment of Laizhou Bay. The composition of reduced inorganic sulfur in surface sediments was dominated by acid volatile sulfur and chromium (II)-reducible sulfur. In fluvial sediments, sulfate reduction and formation of reduced inorganic sulfur were controlled by TOC and reactive iron synchronously. High C/S ratios in the marine sediments indicate that the diagenetic processes in Laizhou Bay have been affected by rapid deposition of sediment from the Yellow River in recent decades. This work was financially supported by the National Natural Science Foundation of China (Grant No. : 41373100 and 40906045).